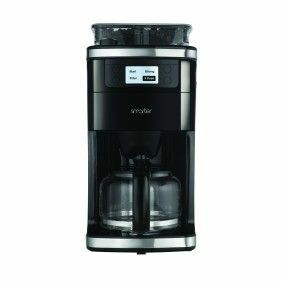 Smarter Coffee grind and brew, is a revolutionary new coffee machine that gives you fresh coffee at the touch of a button, remotely anywhere in the home. Available in 3 colours, Black, Red or Beige the removable panels included in the box, allow you to choose the colour to suit you. 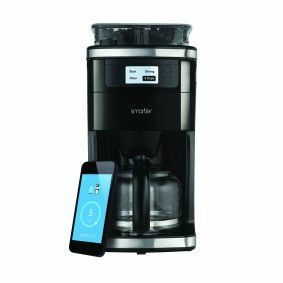 The new Smarter App available on iOS and Android has been intuitively designed to make it easy to control your Smarter Coffee machine remotely. The smart control panel also allows you to use it as a normal coffee machine if your phone is not to hand. Connect the Smarter Coffee machine to your home wifi network and make your cup of Coffee from anywhere and at any time to suit you. Grind and brew fresh beans at any time, just pour in your chosen beans, select the coarseness of the grind and then start directly from your smartphone. With enough water for 12 cups of coffee, you can select how many cups you want to make whether it is just for yourself or for the whole family. The built in water level sensor shows you exactly how much water is in your Smarter Coffee machine, so you know how many cups you can brew. Decide on the strength of your coffee and choose between weak, medium or strong directly on the App, to ensure you get the perfect coffee. The warming plate, can be turned on for up to 30 minutes to keep you pot of Coffee warmer for longer. There is a 4 day delivery time on this item.